Not sure where to buy your ingredients or kitchen gadgets? Wondering if there are tasty and healthier brands available? No worries. 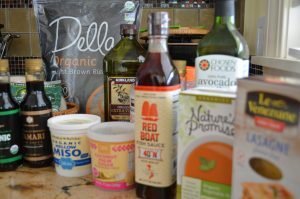 We’ve put together our recommended products and brands for the well-stocked pantry, carefully chosen for their taste and health benefits. Click on the item and you can purchase directly through our Amazon store. We’ve just introduced the kitchen tools portion so bear with us as we update this page.